Visual Illusion of Uniqueness? After Markus and Kitayama 1991, a photo by timtak on Flickr. To support their assertion that Japanese have interdependent selves, Markus and Kitayama (1991) focused particularly upon two sets of experimental data: that of Steven Cousins (1989) and their own data showing that the illusion of uniqueness exists among North Americans but not among Japanese. This was demonstrated by the fact that Americans feel that they resemble others less than others resemble them. 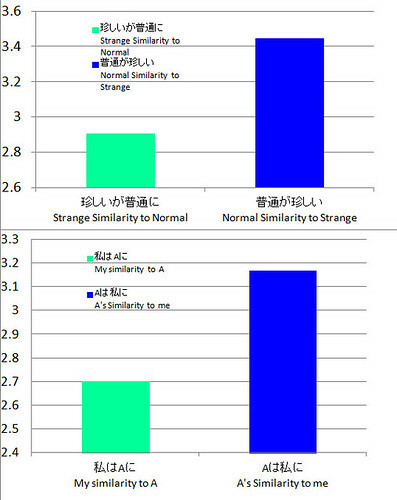 First of all I tested that, as Markus and Kitayama predict, rare things do resemble normal/common things less than the other way around, and (as shown in the graph at the top) it was as Markus and Kitayama predict. However, I also found that Japanese students felt themselves to resemble others less than others resemble themselves, suggesting an illusion of uniqueness as found among Americans but not Japanese in Markus and Kitayama's study. But it could also be because of the experimental method. I have not checked how Markus and Kitayama specified the "other" of comparison, but I am guessing that the other was some sort of abstract other or "others." I asked my students to pick another student in the same room and have a glance at them. This would have emphasised visual similarity. I am pretty sure that Japanese students are big on visual uniqueness and hate it when for instance someone in the same class is wearing the same clothes as them (it makes them want to go home and change). This is one of the reason why Japanese students do not want to wear insignia sweat-shirts (Yuki, 2003). I hypothesise that if the other of comparison is presented visually then the Japanese will considered themselves to be unique. And perhaps the tendency of Americans, all dressed in their insignia T-shirts, to consider themselves unique will be reduced (but since the question is still a linguistic one, I doubt that there will be a reversal). I need a bigger sample size. Yuki, M. (2003). Intergroup comparison versus intragroup relationships: A cross-cultural examination of social identity theory in North American and East Asian cultural contexts. Social Psychology Quarterly, 166-183.